This article reviews the state of education in digital libraries and curriculum planning documents from professional associations in two areas: Library and Information Science; and Computing. 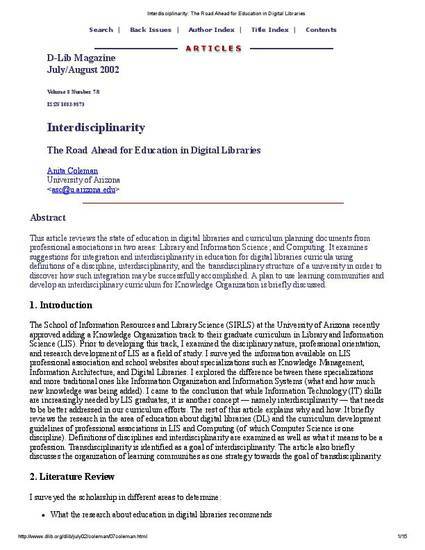 It examines suggestions for integration and interdisciplinarity in education for digital libraries curricula using definitions of a discipline, interdisciplinarity, and the transdisciplinary structure of a university in order to discover how such integration may be successfully accomplished. A plan to use learning communities and develop an interdisciplinary curriculum for Knowledge Organization is briefly discussed.